The only Mac users who firmly believe they don’t need a separate maintenance tool are tech-savvy geeks with tons of spare time on their hands. Otherwise, Macintosh desktop computers and laptops tend to get inundated with gigabytes of junk over time that doesn’t vanish on its own and deteriorates system performance conspicuously. It takes nontrivial day-to-day efforts to clean it all up, and, honestly, few people are as prudent as that and ever bother keeping their machines tidy on the inside. Mac system utilities ostensibly come to the rescue as they claim to automate this whole routine. However, trusting all the apps from this category promoted online is a slippery slope. Many of them act similarly to scareware, and some simply don’t qualify to be deemed effective. Where is the all-new MacBooster 7 in this hierarchy? We’ll do our best to answer this question. To begin with, the vendor – IObit – has numerous proponents and boasts a solid reputation, which probably speaks volumes about the efficiency of their products. Furthermore, much like all the previous versions from 2013 onward, MacBooster 7 goes equipped with a competitive feature set that shouldn’t leave the average user lacking the essential security and performance enhancement functionality. These facts are undoubtedly on the plus side of the app. Does the quantity of its features align with the quality, though? Let’s go ahead and check. Installing MacBooster 7 is no big deal. The only informed decision to make is between free download and paid subscription, the former allowing you to give the fully functional app a shot for 14 days. The system requirements boil down to OS X 10.7 or later and at least 70 MB of free disk space. The current iteration, therefore, appears to take up an extra 10 MB of space compared to version 6. The installation is a matter of a minute or so – nothing out of the ordinary there. Once you run the app on your Mac, the GUI opens up at the System Status pane, which is intended to reflect the results of system checkup by three categories: System Junk, Virus & Malware Scan, and Turbo Boost. Originally, the status is set to “Unknown” and will stay that way until you launch a full scan of your Mac computer. This is doable by clicking on the intuitively located Scan button down at the bottom. Be advised that the very first scan might take quite some time, which is normal because the app needs to familiarize itself with the new system and assess every area thoroughly. When done, it flags the overall system status as Unknown, Dangerous, Poor, or Good. The verdict depends on the amount of junk, the number and severity of viruses or malware if any, as well as memory issues detected during the scan. TThe GUI design has barely changed in this release. Just like version 6, which was quite an overhaul from the previous iteration, the tool presents the exact same modules in the left-hand section of its main console. The features are still split into two segments, namely System Status and Tools. Also, the spooky-looking threat meters shown in the earlier app builds up to version 5 now appear to be obsolete for good. All in all, MacBooster 7 inherits the best traits of its predecessor. Its interface is clean and streamlined, and the names of the features are very easy to interpret, even for inexperienced users. Although there seem to be no noticeable changes over the forerunner at first sight, the devs have made a few tweaks to the way some of the features work. Continue reading to learn what those modifications are. Whereas IObit hasn’t added any new maintenance and security modules to MacBooster 7, a few options did get some fine-tuning. These include the Startup Optimization feature and the MacBooster 7 Mini app. Intrigued? We are now going to lift the veil on these changes and cover the essentials of what the utility is capable of doing in general. The System Junk feature is tasked with spotting and cleaning unnecessary files that the operating system and installed software sprinkle all over your Mac while running. It lets you know how much space can be safely released by deleting redundant application junk files, trash, system log files, old mail attachments, trash, software leftovers, etc. Hitting the Clean button then does the trick in mere seconds. The entire security potential of MacBooster 7 is encapsulated in the Virus & Malware Scan feature. It includes the malware removal and virus scan options. The former detects and obliterates obstinate apps and harmful files that leverage persistence mechanisms and therefore cannot be removed in the commonplace way. The virus scan scours your Mac for malware and the growingly common potentially unwanted applications (PUAs). The utility doesn’t deliver real-time protection, though. Turbo Boost focuses on finding and rectifying issues with disk permissions, cache files spawned by third-party applications, and iTunes media cache. The improvement potential delivered by this module tends to be tangible as it may release gigabytes of disk space that would otherwise be crammed up with stuff you don’t need. Memory Clean, the topmost option in the Tools subsection of the feature set, allows you to optimize the power of your Mac’s central processing unit so that it smoothly handles the processes that matter while dropping the ones that sit in the background. In other words, it helps prioritize your applications in terms of the memory allocated to their execution. One small tweak we have noticed in MacBooster 7 is that the used and free memory indicators have switched places. Importantly, you can click on the Details button to view memory breakdown by processes and close specific ones you currently don’t need. The Privacy Protection tool is meant to locate and wipe all the sensitive traces of your Internet browsing activity that can be abused by advertisers, unscrupulous third parties and cybercrooks to steal your identity. It looks for tracking cookies, app traces, saved passwords, tabs opened during the previous session, recent items (e.g. apps, documents, and accessed servers), HTML6 local storage, as well as the browsing and download history in Safari and Google Chrome. On the face of it, Uninstaller appears to be exactly what it sounds like. A little bit of close inspection, though, reveals that MacBooster 7 has gone somewhat further with this functionality. First of all, it allows you to reset any application to its original state rather than remove it altogether. Secondly, the feature displays the oldest installed items at the top of the list by default. With that said, you can easily sort the apps by size and name, too. Startup Optimization is a one-stop feature to manage the apps that run when you boot up your Mac. You may be wondering how it’s different from the operating system’s native Login Items. Well, it’s a bit more intuitive, plus you needn’t delve into system preferences to make changes. Furthermore, unlike the earlier editions, MacBooster 7 now includes recommendations for each entry, so there is no need to look them all up on a search engine to find out whether they are critical. If it says “Keep” next to an item, then you are better off not removing it from there. Also, this pane lets you easily add new startup apps. The Large & Old Files feature is self-explanatory. Use it to stay on top of what objects take up disk space beyond a certain threshold and have been on your computer too long to be important anymore. You can set file size and age filters for the scan. The default path to check is your Home folder, but you can add more directories by clicking Add Folder or start over by hitting Clear List. Duplicates Finder scans your Mac for copies of the same file so that you can keep only one, if you want to, and get rid of the duplicates. There are extensive filters that can be used to sort the files by size, name, type, and quantity. The “Smart check” option, when enabled, employs ad hoc algorithms to provide recommendations on which objects can be safely deleted. Additionally, the “Smart Clean” feature makes it easy to convert a specific file to alias and keep the original only. The purpose of the Photo Sweeper function is to spot similar or duplicated pictures inside a specific directory or across the hard disk on the whole. Be advised, though, that image removal via this module is irreversible, so you won’t be able to recover it later on. MacBooster 7 Mini is an applet that resides on your Mac’s status bar and provides a quick overview of your current system status, also allowing you to toggle a few features without having to open the main console of MacBooster 7. In particular, the Mini icon reflects the percentage of memory and the amount of HDD space used, real-time network activity stats, and the volume of system junk. Toggling the Lighting Booster switch on will trigger a system cleanup to quickly improve its performance. A prominent addition to the Mini app in MacBooster 7 is the Firewall toggle. You can use it to close or open the default Mac firewall in just one click. In order to adjust MacBooster 7 to your specific needs, select Preferences in the app’s main menu that sits on Mac taskbar. Then, hit the tab for the specific area you’d like to customize. These include General, System Junk, Virus & Malware Scan, Tools, MacBooster Mini, and Ignore List. So, if you aren’t okay with the defaults, the preferences are remarkably easy to set. MacBooster 7 has a number of support options to choose from. The Help section in the taskbar provides links to the user manual, support center, feedback page, and uninstall tips. The vendor’s Online Support Center for this product additionally encompasses FAQs and a form for general questions, bug reports, license issues, refunds, and suggestions. If you badly need round-the-clock priority customer support, though, you will have to purchase the premium service. By the way, the product’s licensing follows a lifetime subscription logic. 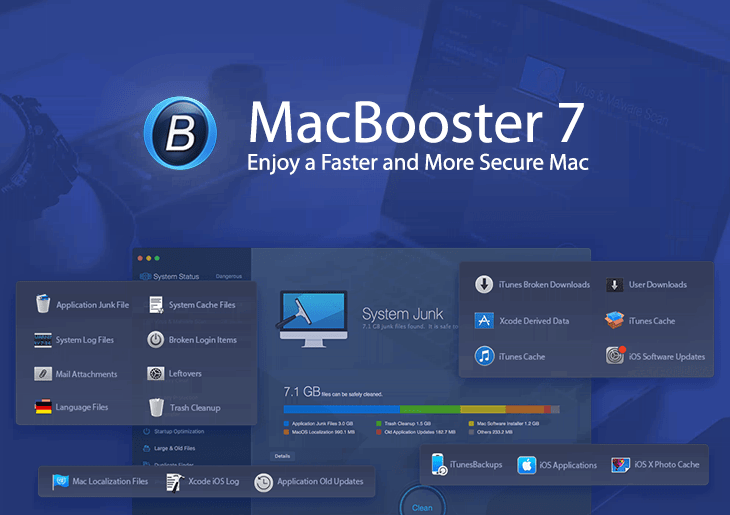 There are both pros and cons of MacBooster 7, although we think the latter aren’t significant. Owing to the well-balanced GUI without any brain-twisting controls, this utility is very easy to use. Its system performance improvement potential is huge, too. It intelligently finds all redundant apps and files, regardless of their type, and allows you to free up a great deal of disk and memory space in just one click. The security component is effective enough to keep the common Mac malware, viruses, and identity-stealing infections away. However, this release still lacks real-time security functions, which is what we anticipate seeing in editions to come. The brand-new things in MacBooster 7 include helpful suggestions added to the Startup Optimization module, as well as the handy firewall switch now complementing the old options in the MacBooster Mini app. Back to the question whether this version is any good – we find it effective and user-friendly. With its nifty features in place, it does the cleanup and protection job for you immaculately and thereby saves you the trouble and time of doing it all on your own.